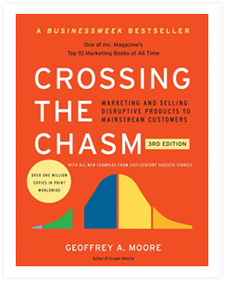 Crossing the Chasm was first published in 1991, and since that time has sold over 1 million copies. The book focuses on the challenges that face entrepreneurs bringing a disruptive innovation to market and how to master them through a proper application of the Technology Adoption Life Cycle. From the outset the idea of the “chasm” resonated with high-tech leaders because it captured a phenomenon they had seen over and over again but had no words to describe. Early adopters would enthusiastically embrace the latest and greatest thing, expectations would soar that meteoric success was just around the corner, investors and management would pile on to ramp up, and then . . . . Everything would start to slow down, and all of a sudden instead of being given the benefit of the doubt the new offer is getting the doubt of the benefit. How to cross this chasm and achieve mainstream market success on the other side is the whole focus of this book. While its core principles have not changed appreciably over the past two decades, the world of high tech certainly has. The new edition highlights a whole new set of players, from public companies like Salesforce.com, VMware, Aruba, and Workday, to private companies like Box, Lithium, and newly public Rocket Fuel. None of these existed the last time Crossing the Chasm was updated, but today they are at the forefront of their respective technologies and all have achieved mainstream market success. So it has been a great journey to incorporate their histories into the frameworks and to adapt the frameworks to reflect their histories. This book is intended to engage the next generation of entrepreneurs bringing to market disruptive innovations destined to change our lives. We need your products and services to make this a better world, and for that to happen, you have to get them across the chasm. Hopefully the ideas and models in this book can make a definitive contribution to your success. (c) 2017 Geoffrey A. Moore. All rights reserved.